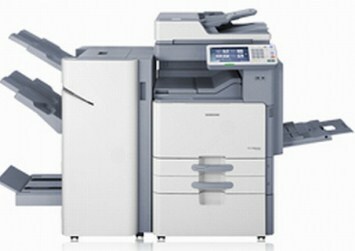 The MultiXpress SCX-8030ND/SCX-8040ND is really a productive, space-saving B&W MFP to the modern office. It could be deployed as the main print device in small businesses or with a workgroup machine in larger enterprises. Sharing a similar user interface and integration platform as other Samsung MFPs, it enables customers to standardise on Samsung devices through the entire office. Samsung’s first A3 mono MFP is that the perfect complement to its A4 devices. A chance to output over-size A3 and create A4 booklets enables Samsung to satisfy customers’ office printing needs with their entirety. The SCX-8030ND/SCX-8040ND has all the things you would expect inside a departmental device : print speeds of 40/30ppm, A3 colour scanner, 160GB hard disk and adjustable colour display. Above all, it could be integrated with enterprise applications for streamlined business processes and improved device management. The control panel tilts and moves side-to-side for comfort and simple use. An 8. 9”, colour LCD touch-screen provides easy navigation of menus. Buttons for power save and eco printing help cut toner, paper and energy use. Support for larger paper sizes as much as SRA3 and media as much as 253gsm in weight allows you to produce high impact marketing material in-house, on demand. Sophisticated finishing options include a hole punch, stapler and booklet maker. Large handles and adjustable paper guides ensure paper could be replenished quickly. A typical tray holds 1, 040 sheets, minimising the call for user intervention and allowing long print runs to become completed without interruption. The touch-screen makes operation quick and straightforward. Pre-programme common copy jobs for no fuss copying or use Samsung’s XOA platform to customise the screen along with your own branding and selection of functions, applications or workflows.